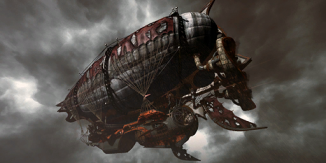 The Airship is a Killing Floor 2 map. Is was added in the game as a part of Treacherous Skies update. It is the first map to indroduce optional "Weld and Repair" and "Operate and Control" objectives rewarding players with extra Dosh, XP and Vault Vosh. Plenty of traps scattered around this map to aid players in combat. Lockhart is back, and it seems his problems are never ending. Last time you saw him, you had helped him launch away to his airship. Now, having followed him, you find the sky a most dangerous place, and not just because you need to help keep the Queen Victoria running! "Operate and Control" objective under the Dome area. Players have to keep ZEDs off of the designated area for 20s to be able to (re-)activate the lever. Activations required to complete the objective fully, per player: 1p - 2, 2p - 3, 3p - 3, 4p - 4, 5p - 4, 6p - 5. Each activation adds % of the promised Dosh / XP / Vault Dosh. Level activation triggers (2.5s delay) water flush sequence - for next 3.5s on each of the area entrances the stream of water knocks down all ZEDs it touches and does 7 points of damage within 1s intervals to them. Recharge time - 22s. "Repair" objective requires players to weld the designated objects scattered across the map. Players have to weld each of them in order to complete the task for 100%. Objectives required, per player: 1p - 2, 2p - 3, 3p - 3, 4p - 4, 5p - 4, 6p - 5. Every welded object adds % of the promised Dosh / XP / Vault Dosh. The next objective to weld appear on the map after next 17s from completion of the previous one. It takes 1600 points of the weld intergrity to finish the weld. Lightning battery contains up to 3 charges, it takes 181s to power up one of them. Currently powered lever of the "Electricity Dome" machine causes EMP discharge that covers wide area. It does 1 point of EMP damage. Steam Traps do 5 points of damage and knock ZEDs off of the Airship. Their recharge time randomized within (20-40)s intervals. Traps operate individually, on their own. Boiler Traps do 7 point of fire damage within 1s intervals, Traps have warmup and duration time of approx 8s. Coal Wheel Trap does 7 points of damage and knocks down ZEDs. Dosh Hold objectives on this map follow standard rules. This page was last edited on 11 November 2018, at 08:03.